"Where Cross the Crowded Ways of Life"
Following the Civil War, jobs provided through the industrial revolution encouraged many to move to the cities, especially to the northeastern United States. Frank Mason North (1850-1935) composed one of the first social gospel hymns devoted to the special needs of the increasing urban reality. Educated at Wesleyan University and ordained in the Methodist Episcopal Church in 1872, North served congregations in Florida, New York, and Connecticut. 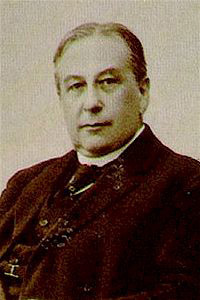 He influenced many organizations, serving as editor of The Christian City (1892-1912), one of the founders of Methodist Federation for Social Service (1907), corresponding secretary of the New York Church Extension and Missionary Society (1892-1912), secretary of the Board of Foreign Missions (1912-1924), and president of the Federal Council of Churches of Christ in America (1916-1929). North’s importance for Methodist missions is attested today by the granting of the Frank Mason North Award for Distinguished Mission Service by the General Board of Global Ministries. “For equal rights and complete justice for all men in all stations of life. For the protection of the worker from dangerous machinery, occupational diseases, injuries and mortality. For such regulation of the conditions of labor for women as shall safeguard the physical and moral health of the community.
. . . For the recognition of the Golden Rule and the mind of Christ as the supreme law of society and the sure remedy for all social ills. With New York City as the backdrop, “Where cross the crowded ways of life” was written at the suggestion of Caleb T. Winchester for the committee that prepared the 1905 Methodist Hymnal. The tune GERMANY, to which the hymn is usually sung in the United States, was chosen by the committee. The text first appeared under the title “A Prayer for the Multitudes” in the June 1903 issue of The Christian City. The author of many hymns, North first had his poetry published in Hymns and Other Verses (1931). When the request came to North to compose a hymn on a missionary theme, he protested his ability to write hymns,, but promised to try his hand. Shortly before this appeal to prepare a hymn, he had preached a sermon on Matthew 22:9 with a translation of the passage as “Go ye therefore into the parting of the highways.” This idea captured his imagination as he thought of the traffic of the great urban centers of the United States and beyond. The hymn is as current as it was when first written over 100 years ago. We still struggle with the divisiveness resulting from the “cries of race and clan.” Our cities are still “haunts of wretchedness and greed” and places that “lure… with greed.” Responding to “tender childhood’s helplessness,” “woman’s grief” and “man’s burdened toil” (stanza three), North reminds us of the one who offers a “cup of water” that “holds the freshness of [Christ’s] grace” (Matthew 10:42). North prays for the transformation of urban hopelessness into places that reflect the “glorious heaven above . . ., the city of our God,” a reference to Revelation 21. “Where cross the crowded ways of life” has served as a paradigm for some of the great hymns on the city that followed later in the twentieth century including “O holy city, seen of John” (The United Methodist Hymnal, No. 726) written in the same decade by Episcopalian priest Walter Russell Bowie (1882-1969), and two British hymn writers observing urban blight in the 1960s and 1970s, “All who love and serve your city” (The United Methodist Hymnal, No. 433) by Erik Routley (1917-1982) and “When the church of Jesus” (The United Methodist Hymnal, No. 592) by Fred Pratt Green (1903-2000).